When Toys”R”Us filed for bankruptcy, the retail giant closed around 700 locations worldwide and thousands of shoppers were left without their toy store of choice. The retail landscape is changing rapidly, and there was no one reason behind the bankruptcy. Analysts pointed to cost cuts, retail competition, and the inability to innovate, to name a few. Those factors can be debated, but what’s not up for discussion is the gaping hole left in the already fragmented retail market. Over the decades, the toy tycoon has amassed a loyal audience of employees and customers. But, just because Toys”R”Us is gone, that didn’t mean they stopped buying toys overnight. Criteo wanted to know: what happens when such an influential retailer goes out of business? How do consumers adapt? And what kinds of opportunities are there for other retailers? We surveyed more than 1,000 Toys”R”Us customers to find out. 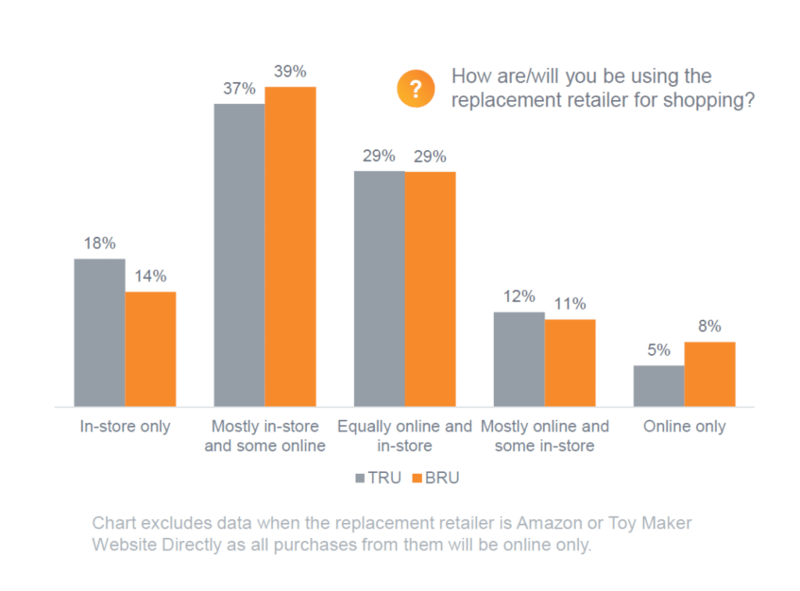 In Criteo’s Toys”R”Us Shopper Survey, we asked consumers how they’re adapting and where they’re buying now. 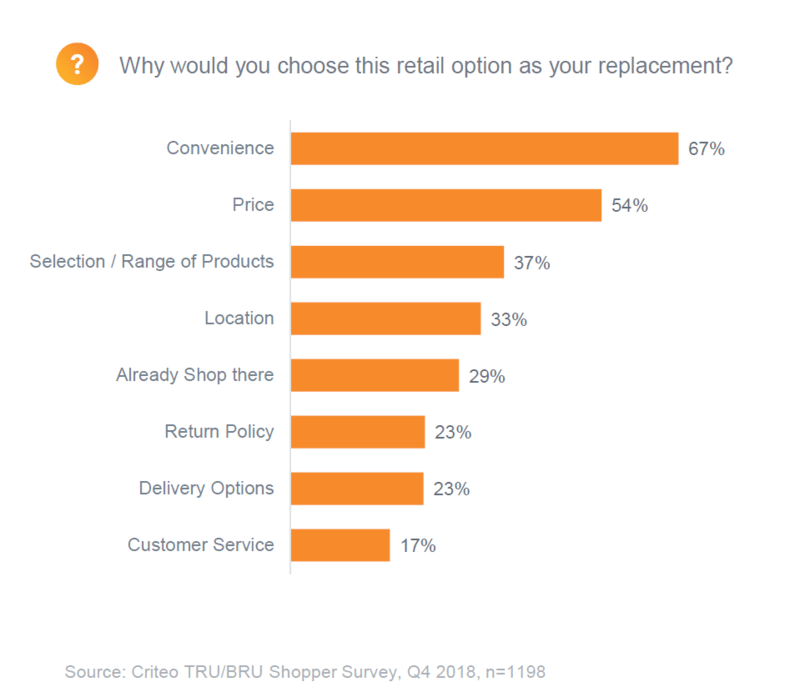 At a very macro level, convenience and price were the top considerations for a majority of shoppers when they were looking for a Toys”R”Us replacement. There is a relatively new sentiment across the retail industry that price isn’t definitively the top driver behind consumer purchases. In the lives of our everyday consumers, the convenience factor is now competing with the affinity to store prices. The true value behind the convenience factor is the ease of purchase and the seamless shopping experience. For Toys”R”Us customers, the need for the lowest price on the market is a close second. Nonetheless, it’s apparent that some retail giants have the opportunity where Toys”R”Us couldn’t capitalize. Traditional retailers benefit from the convenience shopper, as the combination of in-store and online options provides a powerful draw. In light of looming competition that is able to compete on both price and the online shopping experience, it’s imperative that big brand retailers focus on meeting the expectations of this consideration factor throughout the entire omnichannel experience. Despite the belief that consumers won’t leave their couch to shop, proximity was a differentiator for Toys”R”Us. Around two-thirds (65%) of survey respondents confirmed that they will continue to buy more in physical stores and/or will buy equally online and in stores for select products. This is where location has an impact. Two in three shoppers lived within 20 minutes of a Toys”R”Us or Babies”R”Us store. Walmart and Target happen to be big brand retailers that are in a position to provide the same convenience. With respondents who said that location matters, consumer preference leans toward large-footprint retailers such as Walmart and Target. 3. In-Store Experience = Customer Loyalty. It’s clear that the loyal customers of Toys”R”Us and Babies”R”Us cherish the elements of in-store shopping: touching and seeing items before buying, the coveted monthly Toys”R”Us magazine, the overall layout and experience. Though location and proximity is a driving factor behind foot traffic and purchases, the in-store buying experience still ranks high among those surveyed. Our insights lead us to believe that consumer loyalty is actually led by in-store interactions when it comes to this customer base. 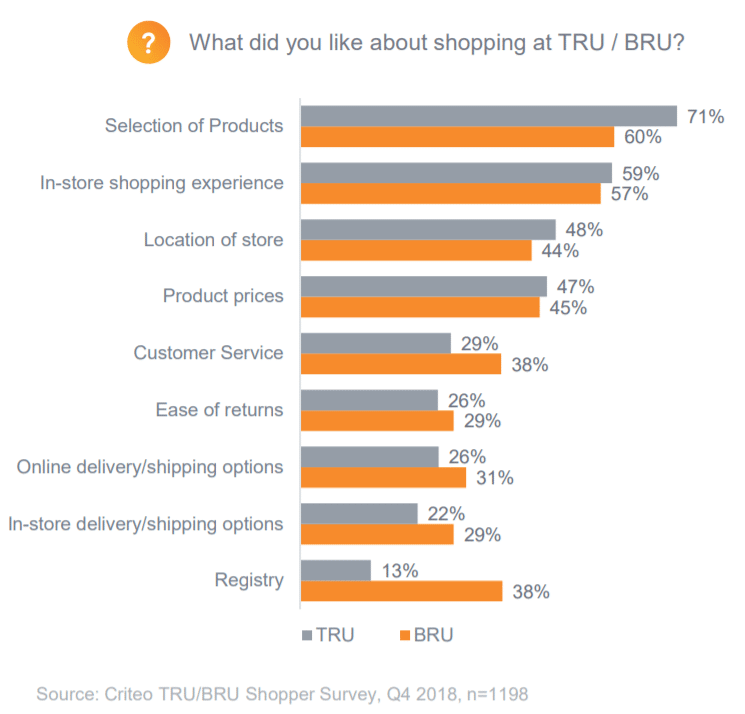 When asked what they liked most about shopping at Toys”R”Us, a majority of respondents specifically indicated that the selection of products and the in-store shopping experience were the positive factors they needed in a retailer. This holds true when we found that in the last 12 months, 32% of those surveyed who shop in-store have purchased more than 3-4 times. Convenience, the physical footprint, and in-store experiences all play a major role in the relationship between brand and customer. What we really uncovered in this survey is that there are serious lessons that big retailers can learn from what made consumers loyal to Toys”R”Us. In an effort to anticipate the future of the ever-changing retail market, we must look to the pioneers of the past. Visit our report for the full insights and more: Retail Disruption & Opportunity: The Toys”R”Us Shopper Survey.